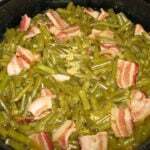 Home » Recipes » Family Favorites » Southern Green Beans – Like Granny Made! 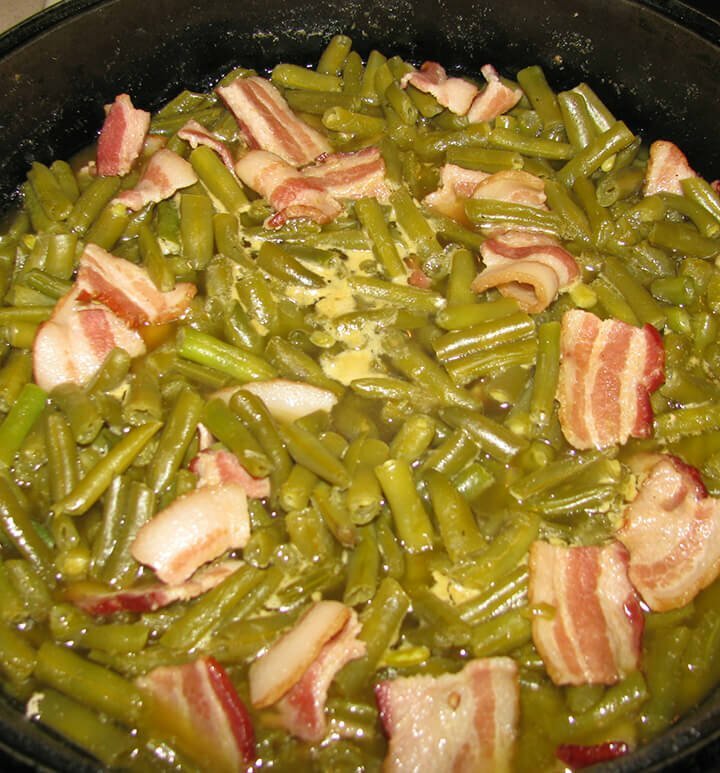 Southern green beans are flavored with bacon and cooked low and slow until tender. These green beans are so easy to make and a must-have side dish on every Southern table. I’ll tell you a secret: I prefer my Garlic Roasted Green Beans, but my family loves these old-fashioned Southern green beans, cooked to death and full of fat. I learned how to cook green beans at a young age because it’s one of those recipes that’s not a recipe, but more of a technique and a perfect way to start young kids in the kitchen. I’ve included measurements here for those who need it, but cooking Southern green beans is really about taste. After you’ve cooked these green beans a time or two, you’ll know just about how much seasoning to toss in the pot to start out with and then you taste once the beans are almost done and add more if needed. There are no special tools needed for these Southern style green beans. All you need is a large Dutch oven and you’re good to go. I love this one from Le Creuset or for a less expensive option, this one from Lodge is great or this one from Amazon Basics. **Pro Tip: If you’re looking for Le Creuset cookware, find an outlet store near you or the Factory to Table sale—you’ll find some amazing deals! Sauté the bacon in a large Dutch oven until it’s done but not crispy. Remove bacon from pot with slotted spoon and save on a plate. Add the green beans to the pot and stir the beans until they are well coated with the bacon grease. Then add the bacon back into the pot with the green beans. Add the stock and seasonings and bring to a boil. Once the beans are boiling, turn down to medium-low and keep to a low simmer. After about 25 minutes, add half a stick of butter, then simmer another 10 minutes or until beans are tender. Taste and add more seasonings if needed. They will taste just like Grandma’s! Enjoy! 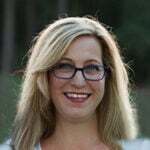 What Goes with Southern Green Beans? If you’ve ever visited a meat-and-three in the South, you know that green beans are always on the menu. And really, they go with almost anything. Some of my favorite things to serve with Southern Green Beans are Fried Chicken, Meatloaf, or Baked Pork Chops, and of course we always have green beans on our Thanksgiving Menu. Speaking of Thanksgiving, you might want to add the Ultimate Green Bean Casserole to that menu as well! And your meal won’t be complete without some Southern Buttermilk Biscuits or Cornbread! But what should you serve for dessert? How about a traditional Southern dessert like Southern Banana Pudding or my famous Fudge Pie, Cream Cheese Pound Cake, or Peach Cobbler. Any of these will help you round out the best Southern meal with your green beans! If using fresh beans, snap off the ends of the beans and then snap the beans into about 2-inch pieces. If using frozen beans, there is no need to thaw before cooking. Just sauté the frozen beans right in the bacon grease as directed. You can add small potatoes to the pot and cook along with the green beans. Green beans should be kept in the refrigerator before and after cooking. Cooked green beans will keep for several days in the refrigerator so this is a great make-ahead dish. To freeze green beans, allow the beans to cool and then place in a freezer-safe container along with all the liquid and the bacon. Place container in the freezer and keep for up to 6 months. 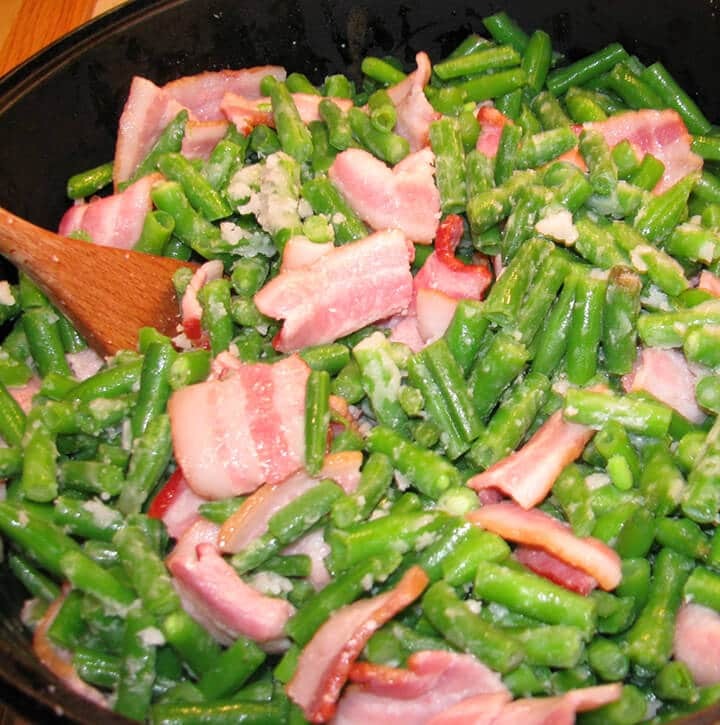 Southern green beans are easy to make, tender beans that are flavored with bacon or ham hocks. These green beans are a must-have side dish on every Southern table. If using fresh green beans, snap off the ends then snap the beans into 2-inch pieces. Wash thoroughly. 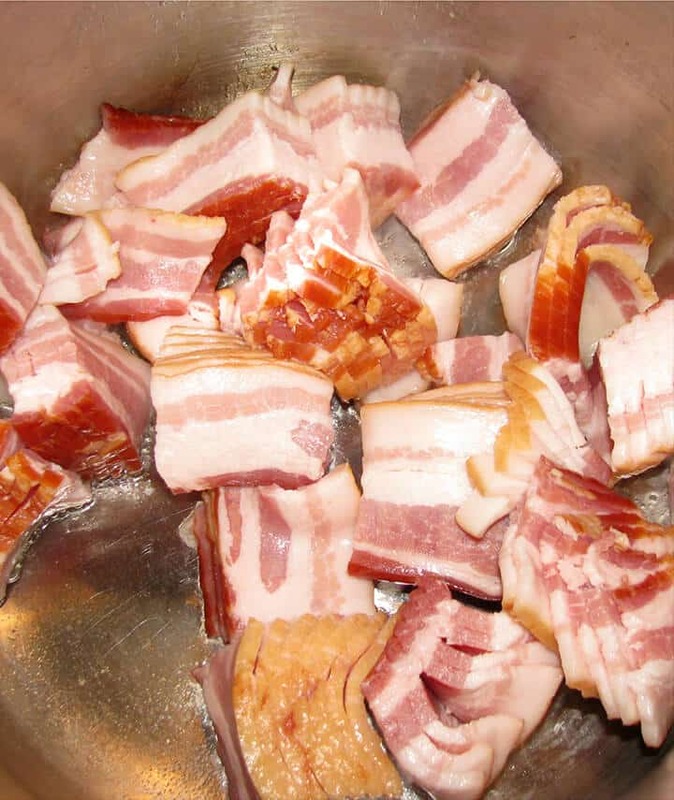 Cook bacon until crispy, then remove from pot. Add green beans to bacon grease and stir to coat well. Add bacon back to pot. Add broth, garlic powder, salt, and pepper. Bring to a boil then turn down to a simmer and cook until tender, 30-45 minutes. Taste periodically and add seasonings as necessary. Add butter to pot when beans are almost done. Season with additional salt and pepper as needed. Update Notes: This post was originally published September 17, 2010, and on November 21, 2018, was updated with one or more of the following: step-by-step photos, video, updated recipe, new tips. For a few more ideas using green beans, check out this post from Southern Living with 31 Green Bean Recipes! Previous Post: « Southern Deviled Eggs – Easy and Delicious!